Hey peeps! I’m home! Got a lot to catch up on, so I’m going to put all this in one post, and warn you all that it’s going to be very long. I’ve been trying to keep up with photos and such on facebook and Instagram, so some of this might be repeat. Otherwise, settle in with some coffee and let’s go! Despite all obstacles, Jason and I managed to organize everything in the house crisis to be ready to go on vacation. We sent the boys off to school and got a Lyft to the airport. The flights were a bit bumpy but we got a row to ourselves on the second one, which was nice. I bought The Hypnotist’s Love Story (Liane Moriarty) in the airport bookstore and spent my flight reading. Once in Seattle, we had an eventful Lyft through town during rush hour and finally found the “hotel” (which was actually an apartment complex with apartments as hotel rooms). Jason and I went out walking (we were about two blocks from the Pike Street Market) and ate at a brewery that was delicious. I had a Cuban sandwich that was divine, and Jason had a crab chowder that was also apparently divine. It was an excellent choice of restaurant. More walking around – saw the first ever Starbucks store! – and then we crashed out after a long day. We had the most quintessential Seattle morning ever. Breakfast at a café, followed by a walk through the now-open Pike’s Street Market (sadly, no fish-throwing that we saw), followed by a walk in the rain. Ha! Late in the morning, we checked out of our hotel and lugged our giant suitcases about a mile away to the pier. Only to discover it was the wrong pier. (Same thing happened to us on our last cruise!) Our pier was another 2.5-miles away, and that was not happening with our suitcases! So we called for a Lyft, where we had this terrible experience with a guy who tried to get us killed en route while going the wrong direction for several miles to increase the fare. We reported him. Obviously. It took about an hour to check onto the ship (miles of lines…), and then we settled in to exploring. I finally saw the Space Needle from a distance! And then we were off, heading out toward the Pacific and down to Oregon. I finally saw the Pacific Ocean for the first time in my life! Bucket list goal – check! We arrived in Astoria mid-morning. Astoria is this small town that’s the setting of The Goonies, with some parts filmed there. 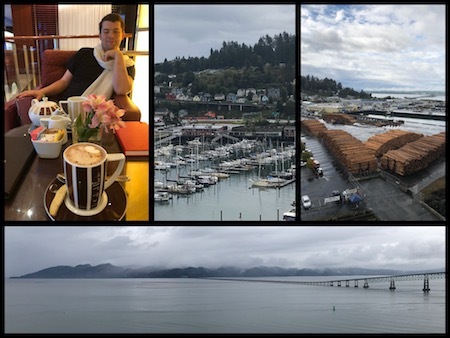 However, between rain (with squall/waterspout warnings) and jet lag kicking in, Jason and I decided to stay on the ship. We lazed about, took naps, explored a bit more. I got a lovely massage. It was the perfect lazy day, and just what we needed after months of stress. Jason is an introvert and I’m an extrovert that needs a lot of personal alone/quiet time, and neither of us have had that me-time for months. We decided to just take some time for that on this vacation, rather than trying to Do All The Things. So we had some specialty drinks and some gelato and crashed out early. Coolest thing happened during breakfast. 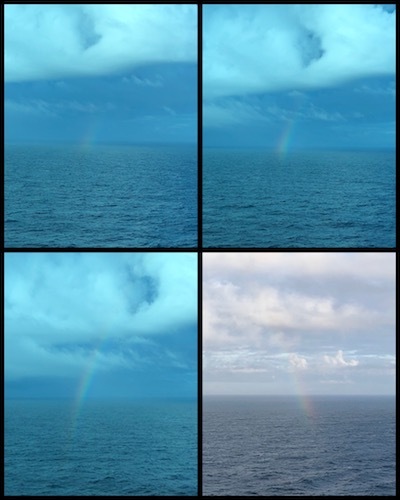 Out the window, we watched a rainbow form over the ocean. It started as this barely-there thing – I even asked if I was just imagining it through the tinted glass – but it grew and grew. Eventually it was an entire arc across the sky, though I couldn’t photograph that from my vantage point. We rushed outside, but in those 30 seconds, the front half of the rainbow had disappeared into dark clouds, and we watched the back half fade into the ocean. I’ve never seen the entire life-cycle of a rainbow before. It was the most amazing thing! Later in the day, there was more napping, more relaxing, formal night with a delicious dinner, watching whale plumes out in the ocean (!!! ), and then a bizarre show with a hard-to-determine plot that essentially went: birthday party, couple breaks up, peacock mermaids appear, couple gets back together, raunchy sexist song that had nothing to do with anything. Totally the WTF moment of the trip. Unfortunately, between aching muscles, sunburn, and two nights of severe insomnia in a row, I was not feeling well enough to leave the ship on our second day in port. 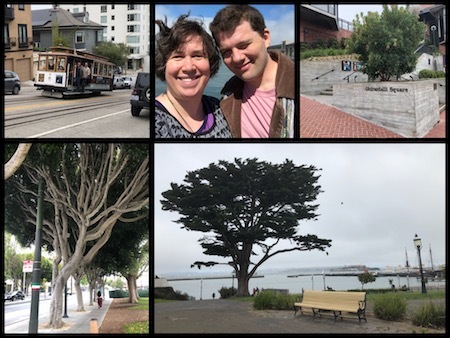 We’d planned to walk across the Golden Gate Bridge, but instead I stumbled through a few hours of zombie-waking before I crashed out for most of the day. Jason didn’t feel great either, and decided to hang around the ship having some quiet time instead of going back out into the city. 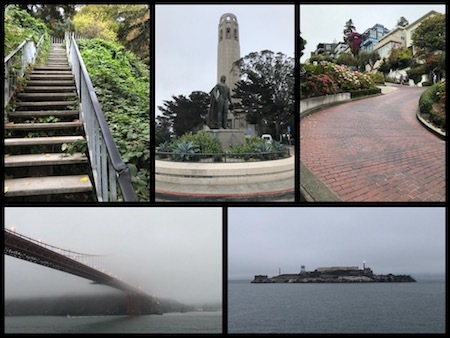 We left San Francisco mid-afternoon on Day 6, and didn’t arrive in our next location until mid-afternoon on Day 8. The first night out on the ocean, we attended a fabulous acrobatic show. These are my favorites of cruise performances. The amount of strength and balance and flexibility required to perform while on a swaying ship just astounds me. The rest of the time was devoted to reading, napping, and general lazing around. I’ve lumped all these days together because it began pouring right as we arrived in Victoria, our last port-of-call on the cruise. Just like with Astoria, we had no desire to go explore the city in pouring rain, especially when it was in the 50s outside. So we stayed on the ship. More napping (I swear I napped more on this cruise than I have in the last year combined). Then a lovely last dinner on the ship, and we were done! 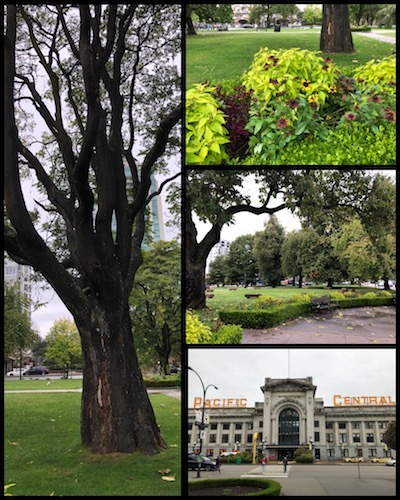 We spent most of our next day in travel (oy), though I will admit that the short trek we made through Vancouver was beautiful – would’ve been nice to explore a bit more! 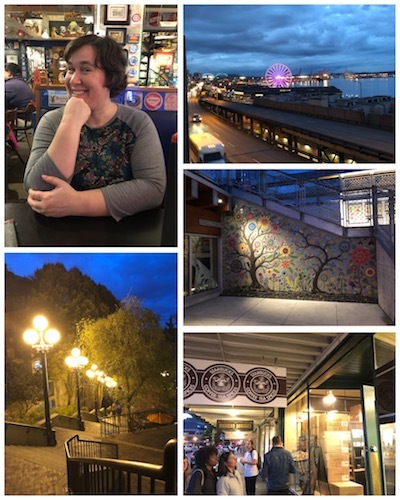 The trip back to Seattle was uneventful, and then we had a special evening out where we met up with Kristen from We Be Reading for dinner! 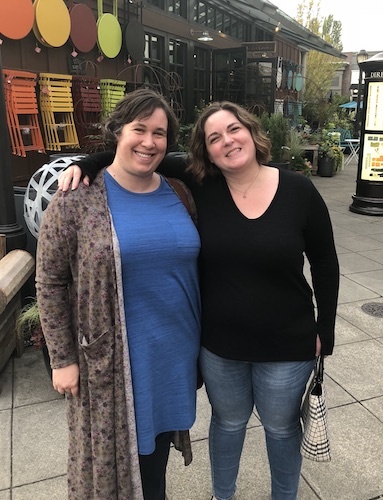 Kristen and I have known each other for ages and ages – we started blogging around the same time – so it was so good to finally meet up in person!! We talked and talked for hours through the evening before Jason and I finally had to go back to the hotel because we had a super early flight the next morning. Flights went well, and then we were home again! It was the perfect-sized vacation, with just enough time away to look forward to getting home. Still trying to unpack and do loads of laundry and upload photos and clean up the messes that were left before we flew off, but we’ll get there! This is our third cruise, all three with the same line (Celebrity). We haven’t been on one since 2013, and there have been a lot of changes since then. There was a lot more marketing toward a younger crowd (hashtags all over every event, 90s-2000s music everywhere…). There was far less variety of food, and at dinner, they served three courses instead of four. There were far fewer employees and events as well, all of which made us think that perhaps the cruise line is suffering for money a bit. Our personal experience was different this time as well. 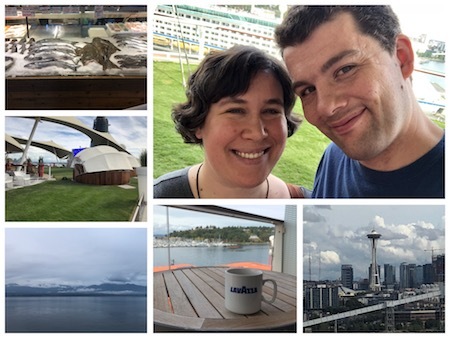 Instead of going into the cruise with an attitude of trying/doing everything, we spent a lot more time to ourselves (together and separately), and didn’t bother with shore excursions and such. The weather was pretty bad throughout most of the trip, which lent itself toward introversion. On a more cheerful note, we had a room with a balcony instead of being in an interior room without even a window. We had a drinks package for specialty coffees, alcohol, fresh juice, etc, which we’d never bothered with before. I guess we just upgraded a little this time, since it’s our first vacation with just the two of us since March 2014! And it was fun to experience some new things on board, like talking with our sommelier (who was awesome!) and hanging out at the coffee bar. I will say that there were two real big downsides to this experience compared to my last two cruises. First, my size made me feel very uncomfortable. I wasn’t able to walk up ten flights of stairs like before. I didn’t feel comfortable exercising in person (especially after the guy on the fitness center tour looked at me like “yeah right, you want to exercise?”), and I was self-conscious about my clothes and food and all the rest. Back when Jason first booked this cruise in March, I had high hopes of losing some weight and feeling good about myself when we arrived. I was well on the way to that, with ten pounds lost by mid-May, but then my house exploded and stayed exploded for months. Between stress and inability to exercise and eating out far more than normal, I regained those ten pounds and barely managed to not get even higher. All of that lent itself to my self-consciousness and tendency toward solitude on the trip. It makes me feel as if I should make a goal to lose a certain amount of weight, and reward myself with another of these trips (which is exactly what I did in 2011, which led to my first cruise in 2012). So we’ll see. Second, I’ve never done well going west in terms of jet lag. It’s the same problem I have with the fall time change – it forces me to go to bed later, but my body still wakes up as if nothing has changed. All that causes me to get much less sleep, so compared with former cruises (that all went east or stayed in the same time zone), I was far more fatigued this time. As I said above, I spent more time napping on this cruise than I have in the last year combined. Between the naps cutting into any activity/reading time, and missing most of the shows because I was too exhausted to stay up for them, I feel like I missed out on a few things. Especially given that weather caused us to miss out on two of three ports. I guess I need to keep this in mind about future cruises, and build any lingering time-change differences into my plans for the trip! One last note: We couldn’t have done any of this without my amazing friend Natalie, who stepped up to take care of our boys while we were gone. She doesn’t get on social media at all, so it’s likely she’ll never see this, but she deserves all the shoutout that Jason and I can give her. This vacation wouldn’t have happened without her help and generosity. So thank you, Nat. That’s about it. I’ll probably be a bit sporadic still about posting until I can really catch up from the last month of house-explosion and travel. But I’ll be back to my regular blogging self soon! Hope all of you are well! 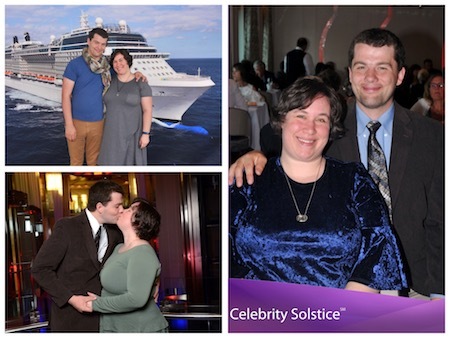 This entry was posted in Personal and tagged cruise, travel. Bookmark the permalink. Following your photos on IG, it looked like you were enjoying yourselves, as you should! It was really nice. And I’m glad we chose the cruise I would be jet-lagged on during the time when I needed a lot of extra sleep and rest anyway, ha!